Time for a classic performance from Uzbekistan, on a very late 78 rpm recording from ca. 1961. Komiljon Otaniyozov (1917, Shovot – 1975, Tashkent) was from the northwest of Uzbekistan, in Khorezm, known for its ruins of ancient fortresses and monuments. 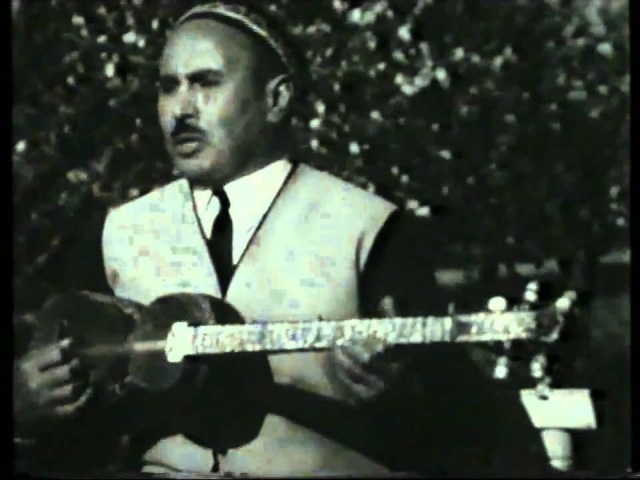 A tar player and singer, Otaniyozov is regarded as one of the finest Khorezmian “bastakors” – almost the equivalent of a singer-songwriter, although technically they are responsible for the all-important melody, which is most often coupled with classic poetry. He had a lengthy career as a musician, speaker, and actor, and was associated with various local conservatories and ensembles. You can watch a few videos of him performing on YouTube, as well. I could find little more on Otaniyozov (also spelled Ataniyozov) that wasn’t in Uzbek, alas, and nothing on his accompanist on the doira frame drum, I. Abdullaev. The history of the recording industry in Russia and the Soviet Union is complex, but a few details are worth repeating. Before the Russian Revolution, there was quite a lot of international recording activity in Russia and its territories, including Uzbekistan. By 1912, there were approximately 20,000 individual recordings issued, in 40 different languages. Most of these pre-Revolution recordings are quite rare (or virtually nonexistent in some cases), particularly those recorded in the territories. 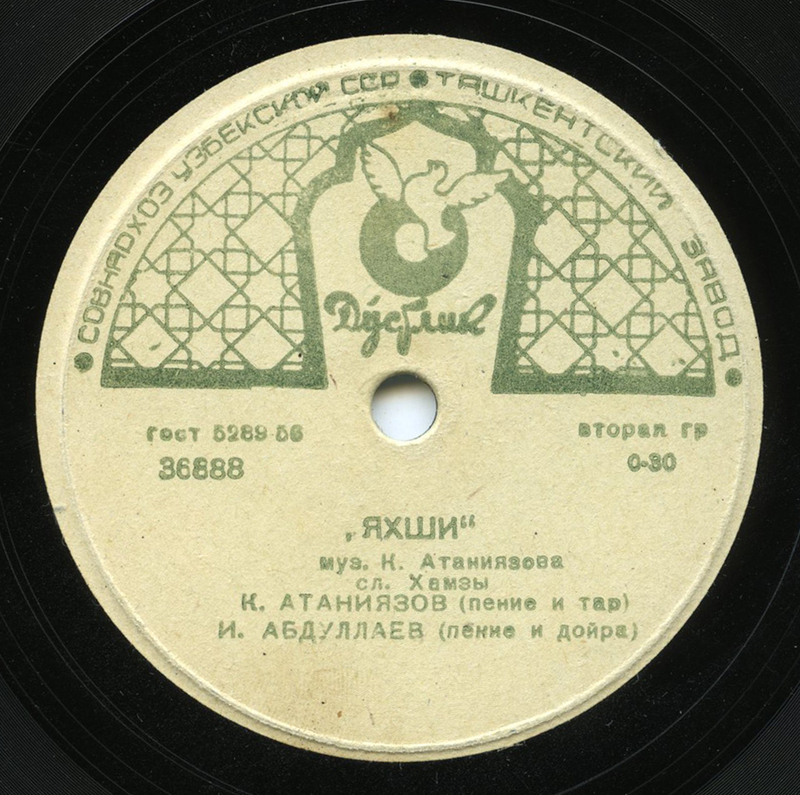 Between 1919 and 1933, there were some labels that re-pressed some of this older material, some newer material was recorded on various labels (Muzpred and Mustrust, for example), and the Gramophone Company’s equipment was moved to Aprelevka, outside of Moscow. In 1933, the state-run, catch-all record company in the Soviet Union referred to as “Gramplasttrest” (Gramophone Record Trust) started operations. They began to produce a non-stop array of music beginning that year, ranging from a dizzying amount of classical music and nationalist/communist anthems and operas, to true regional music from Azerbaijan, Georgia, and Tajikistan, among other territories. I’ve written about this a little in the past: this state-run company had many associated labels, with the majority of them named after the location of their record production plants, such as Aprelevka, Riga, Leningrad, Noginsk, and Tashkent, among others. They were not the only recording company active during the Soviet era – some indies appeared in the 1950s – though they were by far the largest. This example would be approximately, judging by their numbering system, Gramplasttest’s 18,444th release in less than 30 years. However, it appears that it took some time for a substantial amount of music of the Soviet territories to appear again. Some Uzbek material appeared in the 1930s on the Noginsk factory label, but it seems that the appearance of the Tashkent factory label (Tashkentski Zavod) in 1941 really opened things up. For the next 20 years on 78, the Tashkent label and the Soviet industry in general issued a host of traditional music from all the Russian territories, including Mongolia and Afghanistan. They, too, turn up rarely if ever. Thanks to Reto. Information tallied from P. Gronow, the excellent russian-records.com, and other sources. And you can’t go wrong with the Topic CD Before the Revolution: A 1909 Recording Expedition in the Caucasus & Central Asia by the Gramophone Company. Beautiful record. Such a pleasure to listen and to read, as ever.